Good thing too because I have a lot to share. By the way, thank you for all that are reading my blog, without you I would be nothing. Ok, I'm still nothing but at least I can think I'm something. I would really, really like to see my followers over 100 by the weekend. Please recommend me if you enjoy my blog and thanks for your contributions! So, WOW, I got awarded the Stylish Blogger award by two bloggers - Andrew over at Running Man Wannabe and Marcia at Running Off at the Mouth. Thanks you guys, I'm feeling loved! 4) Let them know they've been selected. 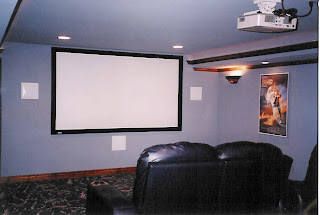 1) I'm a home theater fanatic. Home theater is my other passion besides running. 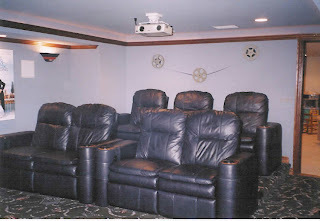 Here's a couple pictures of my home theater. I know Chris K. has been waiting for this. I get to keep my man card! 2) I like to Golf but would not consider myself a golfer. I'm a very high handicap and just plain stink but I love just being outdoors! Unfortunately, I don't care about it enough to get better at it but I know it would probably help me in my career if I was really good. 3) I've been happily married for almost 19 years this year and met my wife at college. 4) My favorite TV show was LOST until that ended. I have not found anything really that good since. I usually watch HGTV, Discovery, Travel Channel, etc. I like things that I can learn from. I'm on the computer more than watching TV. 5) I don't watch any sports(besides the occasional New York Marathon, Ironman and golf-on Sunday) I cannot sit there for hours and watch sports. That includes baseball, football, hockey, basketball, soccer, etc, pro or college. I just cannot get into it. Probably because my Dad never watched it either although my brother loves watching sports. I like going to a game live but never watch it on TV. I won't watch the Superbowl this year and hardly ever do. I don't memorize all kinds of sports names, people, or statistics and don't follow any of it. Who cares who won what game in whatever year? Man card gone now? 6) I love getting away for many weekends and for a couple weeks per year at our cottage up north. It is in a very peaceful place. I could sit outside and relax by the bonfire for hours and enjoy talking with friends. The family enjoys going to the lake, the pool, golfing, walking, running, bike riding, searching for golf balls on the golf course, and generally relaxing. I feel like I'm thousands of miles away when I'm up there and my worries fade away. I also love running up there. 7) And last but not least! The following has happened to me since I started running in June 2009: I went from absolutely no exercise to exercise 6 days per week; I changed my eating habits from fast food and junk food to fruits, vegetables, chicken & fish; I lost 65 pounds; I went from a 40 inch waist to a 30 inch waist; I went from XL shirts to Medium and Small shirts(and always wondered who fits in a small); I reduced my cholesterol from 280 to 140; I increased my energy by ten-fold and cut my stress in half; I reduced my life insurance costs dramatically; I spent way too much money on running stuff; I ran as far as 13.1 miles and hope to run 26.2 this May and I have met some of the nicest people in the world all from running! 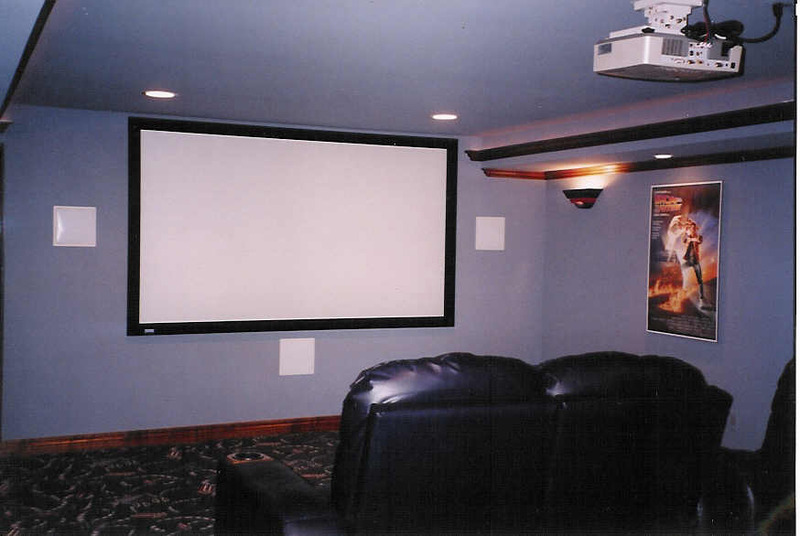 "I don't watch any sports" - You have an awesome home theatre and you don't watch sports. Sorry to say this, but your man card could be in jeopardy! I just showed the pictures of your home theatre to my husband and he is totally jealous! :) Congrats on all your amazing accomplishments!! Love the cottage! I'll bet there's lots of good running there too. I love how far you've come and the lifestyle improvements you've made--awesome! Thanks Jeff! 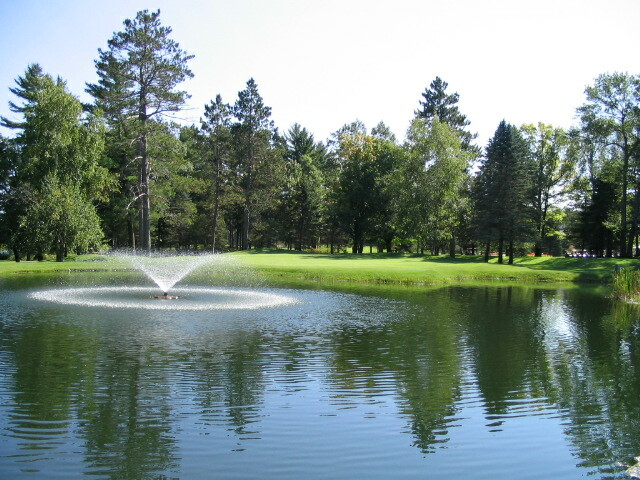 Northern Michigan is really a beautiful getaway area. Congrats to you. Outstanding work you are doing. I guess I am behind the times. My tv is on approx 1 hour a week and is only 32". Beautiful cottage! 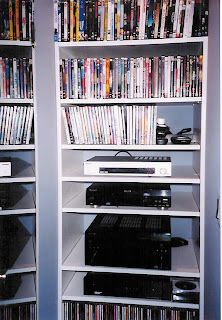 I don't think I'll be showing my husband pics of your home theater though cause he'll want one :) That's one serious set up! Whoa! #7 is incredible. Way to go!! Also, where is your cottage? My family has a cottage on a small lake in Baldwin, MI. I used to go there every summer as a kid and still manage to visit from time to time. Lost was also my favorite show. My husband and I watched religiously, and we even had a Lost party for the finale! lost was awesome. i think i need to have a lost re-viewing. i bet i pick up on lots of stuff the second go-round. 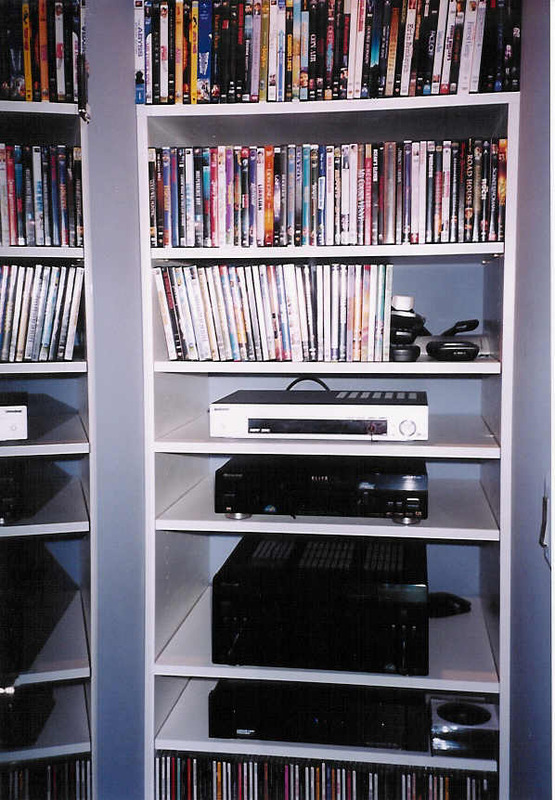 and that is a sick home entertainment system . just wow. LOST was the best. Ever. Quite the man cave, which I think allows you to overcome the lack of sport spectating! You are THE MAN. Heck, you are now my hero. I've never been married but I think number 3 and number 5 are directly related...I know I LOVE that my boyfriend doesn't watch sports all day. =) I also love hearing him try to fake his way through convos with "sports junkies". Love #7. That's awesome. Good for you. Love your cottage. Someday, someday for us. My spidy senses told me you were a home theatre kind of guy. My husband is too. I get to hear about it all the time, although I beg for the Reader's Digest version. We also watched Lost, I miss those characters. I've awarded too so I better go fill out the details. I love the home theatre! I believe with the screen size and paradise up north, you just trumped anyone threatening your man card. Where was the photo with the beer filled frig though? Full THX cert'd theater. Spent wayyy too money on it. Components in the cabnet..etc etc. Thanks for the TAG Jeff - I love reading your page and your progress. Keep up the great work! Thanks for the Garmin recommendation and the kind words. I knew the guy meant well, but what he said just didn't sit well with me. C2Iowa - I actually don't watch much TV either. You would think I would with that theater. We do watch movies often though. EMZ - my wife didn't necessarily want it but she likes it now. Big Daddy - The way both are playing, I'm not sure there's much to talk about even though Lions finished much stronger than ever. Crafty Jogger - So of related. I could watch sports if I wanted, I just like them live only. Andrew - got to love them! Adam - sweet setup you had as well. I just can't imagine you with all those extra pounds! Kudos for changing your life in such a positive way! Nice! Where's the popcorn machine and the "buttery flavor"? No wonder I'm the Running Fat Guy.